One of the world’s top personal finance bloggers, Kerry’s unique and fun approach with ALL THINGS MONEY reaches millions of readers around the globe each year and inspires many towards financial independence. An author, Kerry wrote the book on saving money: 397 Ways To Save Money – to be exact :). She is the Toronto Star’s personal finance columnist, TEDx speaker, a money expert on CBC’s On The Money, and a contributor to the Globe and Mail. She has appeared on lifestyle shows The Marilyn Denis Show, Canada AM, and CTV’s Your Morning. 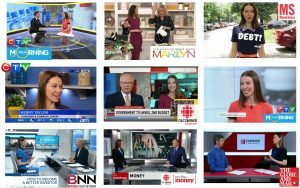 Kerry is all business on newscasts – CBC’s The National, BNN, CTV News, and radio programs across North America. Kerry’s blog, Squawkfox.com was voted Canada’s best money blog by Globe and Mail readers in 2010. Chatelaine named Kerry the “gold standard for personal finance blogging” in 2014 for inspiring Canadians to make wiser spending decisions. Kerry is a journalism graduate from Carleton University. She studied computer science at the University of British Columbia but left after three years when she discovered being an entrepreneur was far more stressful and slightly more profitable. She is currently studying for the Qualified Associate Financial Planner (QAFP) certification and aims to complete the Certified Financial Planner (CFP) designation.